The Second Best Exotic Marigold Hotel loses the plot somewhere in the first 15 minutes, says Nishi Tiwari. Even when John Madden’s The Best Exotic Marigold Hotel emerged as a sleeper hit upon release in 2012, few among us had anticipated a sequel. 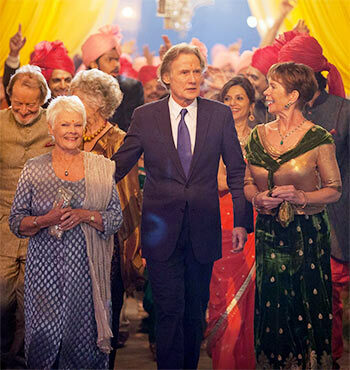 Bouyed by the success of the first film, the sequel The Second Best Exotic Marigold Hotel takes off from where the original left, raising the stakes. The gloriously grey-haired Richard Gere joins the original cast while the film opens with Sonny (Dev Patel), proprietor of the Best Exotic Marigold, looking to expand in all earnestness. Only, this sequel sort of loses the plot somewhere in the first 15 minutes. Evelyn (Judi Dench), Mrs Muriel Donnelly (Maggie Smith), Douglas (Bill Nighy), and the gang are all well-adjusted in their new lives and, as if the storyline wasn’t already overstuffed with subplots, Sonny is getting ready to get hitched to his girlfriend Sunaina (Tina Desai). It’s not just any Indian wedding, too. It’s an Indian wedding conceptualised by a British filmmaker. So, while Sonny scampers from California to India to find investors for his expansion plans even as he locks himself in a seemingly one-sided game of one-upmanship with Kushal -- a friend of Sunaina’s who he sees as a rival -- the bride-to-be is preparing for her impending nuptials that are headlined with elaborate and opulent dance routines for every ritual. Then there’s Evelyn with her fledgling career as a local buyer, her crackling chemistry with Douglas and how they tip-toe around it, Norman (Ronald Pickup) and Carol (Diana Hardcastle) making sense of their new companionship and Madge (Celia Imrie), caught between two lovers. For those who haven’t watched the first film, Maggie Smith’s delightfully acerbic and on point Muriel Donnelly and Bill Nighy’s incredibly charming and handsome Douglas will come across as wildly entertaining. In reality though, the film is marred with over-familiarity -- the wise-cracks, the wry humour and self-deprecation are a tad too well-rehearsed and easily anticipated. Only Richard Gere, solely by way of his mere appearance though (upon his arrival, Madge looks at him and sighs, ‘Lordy, lord have mercy on my ovaries), serves as a flickering light of salvation for the film. His romantic track with Sonny’s gorgeous mum (Lillete Dubey) is in a similar vein as the film’s other sub plots -- overly predictable yet watchable. Sonny himself, played in an overly caricaturish version of an Indian man by Dev Patel, is too high strung and annoyingly animated, discrediting even the supposedly poignant moments in the film. Tina Desai’s Sunaina gets lesser screen time, and the character is only fleshed out to the point where she emerges as a typical bride -- unrelenting in her resolve to have a fairytale wedding and often serving as a voice of reason (albeit reluctantly). In it entirety, The Second Best Exotic Marigold Hotel strikes as overly verbose and preachy. That said though, for all their misguided impressions of all things Indian, British filmmakers do seem to have an ear for peppy Bollywood music. Some of the other high points in the film come when Jab We Met’s Yeh Ishq Haaye and the Jhoom Barabar Jhoom blare through loudspeakers during the wedding ceremonies.